Peter Marks Electro-Industrial, Old School EBM This box set looks a lot more impressive than it actually is, it is not chock full of "unreleased" gems as has been advertised. At best, you get a few (and I do mean few) outtakes and some absolutely killer remixes from the band's latter days. One track is even culled from their wildly popular 2000 album 'Love is the Law'. You also are gifted some differing takes on songs from 1999's 'Algorhythm' and 1997's 'Burnt Beyond Recognition' but the lion's share of new versions are taken from Mentallo's "glory days" back in the early 90s. People will have their delusions, I suppose and the continual insistence by the festering majority of internet arbiters of taste that Gary Dassing did his best work with his brother Dwayne is who this set is designed for. 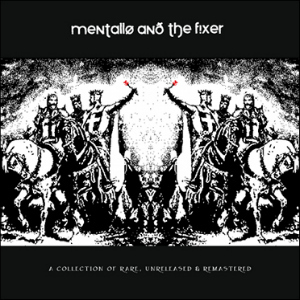 If you're like me and prefer Mentallo after the split then you'll giddily notice what I have about these early "masterpieces". Thank god this band chose the smart option after 'Burnt Beyond Recognition', foregoing the accessible sound they had achieved on albums such as 'Revelations 23' and the perennial favorite of the lemming brigade: 'Where Angels Fear To Tread'. Dassing rejected the expectations people had and did his own thing (he continues to also, a new album is slated for release later this year), and so as a reward to these dubious listeners we have a four disc set put out before the revelations of whatever his next masterpiece will contain. I have to admit, the main thing which annoys me the most about what I'm hearing on here is the annoying voice over that kicks in every track at :49. Yes, I'm aware this is a promotional copy, thanks for reminding me and no, I won't be uploading it as I have a conscience... perhaps a bit of trust in the future would negate the need for these interruptions that take me out of what you've released. Oh who am I kidding. Benestrophe -the pre-Mentallo project the boys had with Jihad's Rich Mendez- gets an entire disc which is mostly culled from their 'Sensory Deprivation' album Ras DVA put out ages ago in 1994. A few cuts from the superior 'Auric Fires' (also put out by Ras DVA but in 1997 this time) meander into the track list as well as a couple tunes from the 'Dora Blue' comp and the legendary compilation 'There is no Time'. Again, put out by you-know-who. This project sounds of it's time and there's a heavy Puppy influence you can drink in but for all the amateurism, Benestrophe still sounds great to me. Their own style was clearly developing at the end in 1990 and it's overdue for Jihad to return, Mendez's lyrics aren't the standard industrial formula of stringing buzzwords together while screaming. Then again, neither are Gary's. I don't suppose there are many out there who could have achieved the righteous tone of rage he managed to with his last album 'Enlightenment Through a Chemical Catalyst'. Other entities which the brothers worked on and with throughout the years also make their appearances (although nothing from Shimri, which is puzzling). Their work with Mainesthai still leaves me with only this conclusion: it's good they only did one album. The music and vocals which Dwayne and Gary provided were solid but that other vocalist... yeah, that'll be enough. Then there's the project even I hadn't heard from them, which I'd imagine was their first, Polyhedron. The two tracks and one remix done by this entry leave little impression. It was nice of him to dig these up but you completist types reading this who have been skimming until it was brought up: these songs are not the holy grail you think they are. Concentrate on the re-done versions from the more recent works, the level of creativity and design are centuries (hee hee) ahead of the somewhat static sound this band had at their onset. Over time you can hear Dassing move well beyond his influences. This box set looks a lot more impressive than it actually is, it is not chock full of "unreleased" gems as has been advertised. At best, you get a few (and I do mean few) outtakes and some absolutely killer remixes from the band's latter days. One track is even culled from their wildly popular 2000 album 'Love is the Law'. You also are gifted some differing takes on songs from 1999's 'Algorhythm' and 1997's 'Burnt Beyond Recognition' but the lion's share of new versions are taken from Mentallo's "glory days" back in the early 90s. People will have their delusions, I suppose and the continual insistence by the festering majority of internet arbiters of taste that Gary Dassing did his best work with his brother Dwayne is who this set is designed for. If you're like me and prefer Mentallo after the split then you'll giddily notice what I have about these early "masterpieces". I read a lot of torturous drivel online about how "teh scene" is so stagnant, how it's all so dumb and ridiculously simplistic and then I see the firestorm of negativity this outfit get whenever a new album appears. Albums which don't play it safe, albums which refuse the autopilot... my, listen to that silence. You lot say you want it challenging and thought provoking but much like Depeche Mode's fans, any attempt to deviate from the formula is greeted with scorn and marginalizing disdain; sniveling derision. So while this box doesn't do it much for me, I appreciate the effort the band went to to appeal to you twits. It's been a blast to wallow in yesterdays passed but the next chapter Mentallo write will be far more interesting than what comprises most of 'A Collection'. I'm much happier to play 'Continuum' myself but who knows, someday a compendium of material from the 'Love is the Law' and 'Vengeance is Mine' eras will surface. A man can dream, can't he?